“Bethany was named by H.LO. Atkinson, who won a nationwide contest. He was given a lot on the beach as his prize. 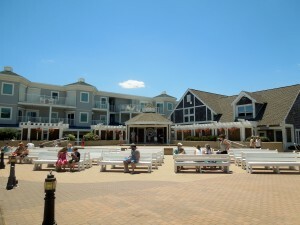 Bethany still reflects the character of the early settlers who were looking for “a haven of rest for quiet people”.” It is known as The Quiet Resort. 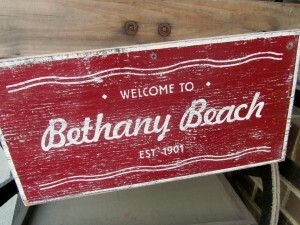 Having lived in Bethany Beach for many years, I cannot help to feel disappointment as I learned the Travel Channel will not be featuring Bethany Beach in the upcoming filming of the best boardwalks in America. Not sure if that is the title of the program, though. 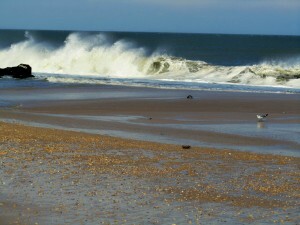 The Travel Channel will be filming in Rehoboth Beach this coming week-end as part of that program. They will be concentrating mainly on the Boardwalk, Bandstand and what goes around it. How I know about this, is because I was contacted by the film company for some information. I am sure they have contacted others in the area, as well. They will also be filming in Ocean City, Maryland, during the Marlin Tournament in a couple of weeks. So I asked them about Bethany Beach. Guess what? No idea it was even there or how far from each other our beaches really are, including O.C. 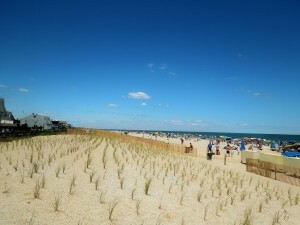 Believe me, I am thrilled that Rehoboth and Ocean City will be nationally featured. But, little Bethany has been left behind. I told them everything I could about why they should film if Bethany, even if only a few minutes. You know, how tiny Bethany is. That’s what people love. I told them that Bethany’s summer life revolves around the Boardwalk and Bandstand. A piece of small town America. Kids playing on the beach, music playing at the Bandstand. I even told them about the Totem Pole; how I had seen Peter Wolf Toth carve it in the 1970’s. 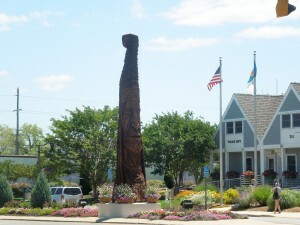 Chief Little Owl, which is a landmark in Bethany Beach was his #22. His gift to give honor to Native Americans; Trail of The Whispering Giants. 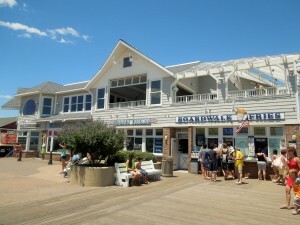 The Bethany Beach Boardwalk, along with the Rehoboth Beach Boardwalk received awards at the same time. Number 6 of 10 Great American Boardwalks. When I look at these pictures, I can’t help thinking….they don’t know what they are missing!! 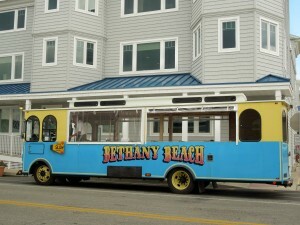 Best way to travel in Bethany Beach..The Trolley!! 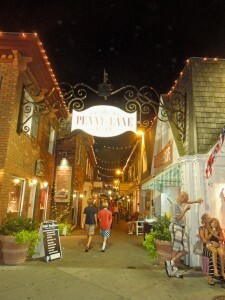 Dowtown Rehoboth Beach looked beautiful tonight. It is mid summer, almost a full moon. Summer’s going fast but, here at the beach, time stands still, it seems that way. We love it. What a coincidence!! Some of us that like to eat, write, and photograph what we eat happened to be at the same place almost at the same time. Bob, Allen and I were at Modern Mixture to eat Tamales. We had the choice of so many restaurants in Downtown Rehoboth Beach but this one was our choice. After meeting Leo on Sunday I could not wait to go back. 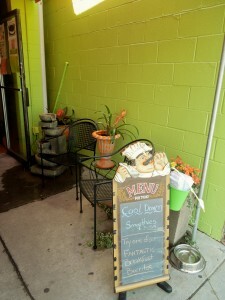 His casual restaurant fits perfectly with our beach atmosphere. Bob, Allen, and I are on the same page. We want you to try Leo’s food. It is light, fresh, delicious and you will become a fan, as well. Leo deserves this extra post, his tamales were awesome!! 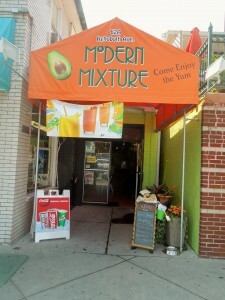 Modern Mixture is located at 62A Rehoboth Ave., Rehoboth Beach, DE 19971. Tel. 302-227-0600. Website? 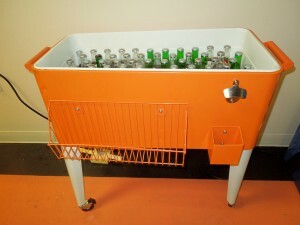 http://www.modern-mixture.com. My husband has to eat gluten free. The tamales were gluten free, so he was in seventh haven. Leo also has other foods that are gluten free. If you have a question, just give him a call. 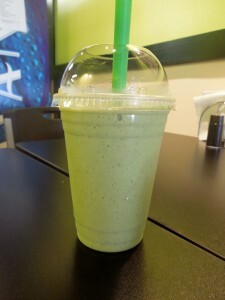 I decided to try another smoothie. 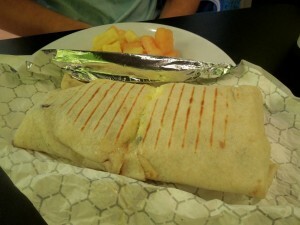 It had avocado and the rest was the addition of a fruit cup; melon, grapes, pineapple. Again, so refreshing!! We ate so many tamales. Okay, here it is. I ate 4 tamales. 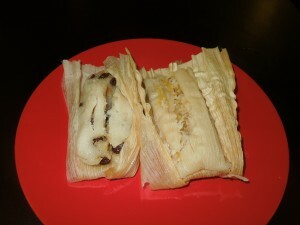 And, a few bites of the dessert tamales too. I know, I know…a few extra laps around the circle. Leo brought 3 tamales each. The Salsa Verde, Chicken and Mole, and Jalapeno and Cheese. 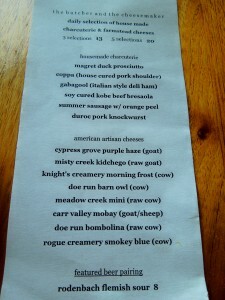 My favorite was the mole. My husband loved the Jalapeno and Cheese. We even ordered 2 for carry out. The dessert tamales were interesting. One had coconut and pineapple and the other had raisins. Both, very good. We decided to eat a little bit of each and take the rest home. Afterall, how many tamales can one eat? Soooo, what are you waiting for? Have a good one!! Gracias Leo. And to Allen and Bob…so nice meeting you!! And isn’t that the truth? Ethnic foods are probably one of my favorites; the spices, aromas, from different countries put you in a certain mood….warm and cozy or that heat that kicks your taste buds up a notch. I dragged one of my sons to Downtown Rehoboth Beach. He was willing, knowing that food was the reward. My sons are foodies. They can eat stones; they have always been great eaters; adventurous is the way I would qualify them. So off to join the many on the road already on Rt. 1. Good thing we knew how to get around the traffic. We were heading to Modern Mixture. No idea where it was; just that it was located at 62A Rehoboth Avenue. Midway through the ocean block. We did not miss it. Bright colors pulling you in. If you are facing the ocean, it will be on the right hand side. Great to see the water bowls for the four legged friends too. The telephone is 302-227-0600 Website? http://www.modern-mixture.com. You can find them of Facebook and Twitter. 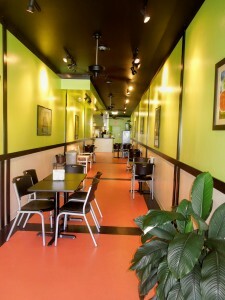 The restaurant is long, with tables and benches on either side. It is a super casual eatery. No alcohol is served. At the end of the hall you will find Leo and his staff. 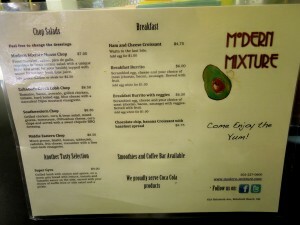 Leo is the owner of Modern Mixture, which only opened in Downtown Rehoboth Beach 2 months ago. He told me that it has been a process, but a good one. Now he would like people to know where he is; to know that he makes, practically, everything in-house, and that his food is tasty and delicious; reasonably priced too. I spoke to Leo in Spanish. I love it when I can give this courtesy to someone that speaks my native language. Leo was great and so friendly. On his menu you will find Mexican Tortas, which are hot sandwiches; Torta Cubana, Torta de Milanesa, Torta Libanesa and a Torta del Chato. The Burritos will be: a Simple Burrito with your choice of meats, Vegetarian, Burrito Mixto, Burrito Moderno, and a Burrito Chido with pulled adobado pork, refried beans, guacamole and pico de gallo. Falafel, sope which is a homemade tortilla, lightly fried, topped with refried beans, homemade chorizo, lettuce, radishes, onions, sour cream and queso fresco. 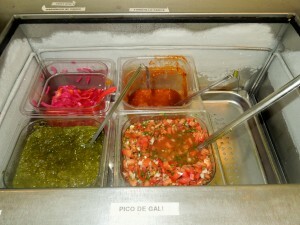 Salsa of your choice on top. 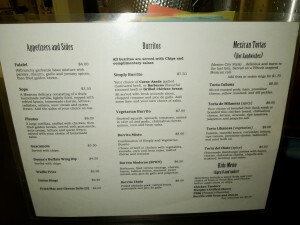 The always present guacamole and even a kids menu. A little bit of “mixture” for everyone. 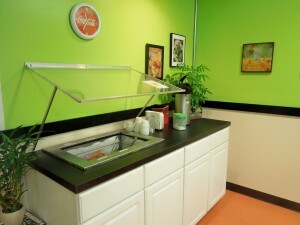 A salsa bar to serve your own sauces, all homemade. My son wanted a breakfast burrito. 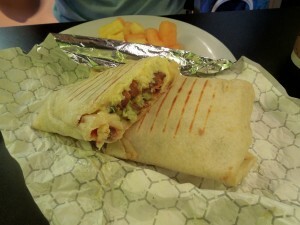 So he decided to customize it with egg whites, avocado, bacon, and refried beans. It came with fresh fruit. An Americano coffee for his drink. It was a beautiful burrito and it was sooooo good. Let’s put it this way, he said “I will definitely come back here”. I wanted a smoothie. Leo asked me if I wanted a healthy one. Of course!! 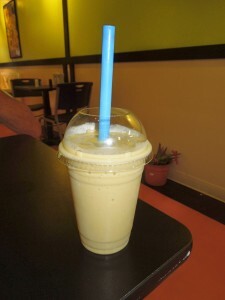 My smoothie was made with a whole avocado, mango, pineapple, and spring mix salad. Only ice was added. 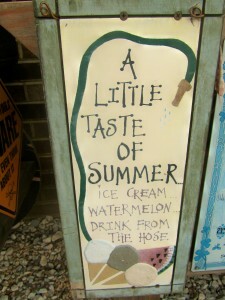 It was so refreshing and I was so surprised that no other liquids were included. Leo suggested I give his fish tacos a try. Either fish or shrimp. I ordered one of each. They were beer battered and the fish used was wahoo. They were served with a bean, tomato and corn salsa. Chips also. 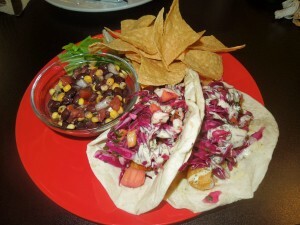 Lately, I have been checking out the fish tacos and Leo presented them in a flour tortilla, and a tasty sauce. The fish and the shrimp were crunchy on the outside and very moist inside. Just very good, indeed. I, had to ask, I just had to….Do you have corn tortillas? A lot of people do prefer them to the flour ones, but my question was because I wanted to find out if someone with a gluten allergy could eat at Modern Mixture. At present, he only has flour tortillas. The reason being that the corn tortillas he has tried, have not been to his satisfaction. Looking for a supplier. Regarding eating gluten free. He makes soups and tamales that are gluten free. All you have to do is call him ahead of time and find out what’s on the menu and ask. 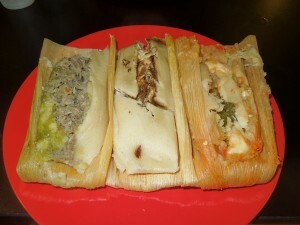 By the way, Monday, 7/30 he will have tamales…just in case you are interested. Leo was not going to let us go without trying his fried ice cream. 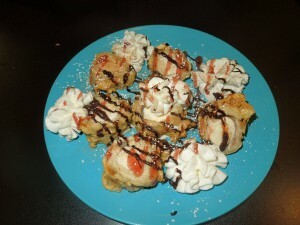 My downfall is ice cream and I do love it fried. His were perfect for sharing; it was a large order. So good; the dough around it was still so warm. Oh well, hitting the gym is an understatement. Word of mouth is an amazing advertising tool….stop by and let me know how you like it. Have a great week!! Talk to you later. Some went to the ball game and others decided to try one of the many restaurants in downtown Baltimore. Baltimore did win on Thursday and the city was crowded. My sister in law is always looking for those special restaurants; the ones that are unique. In Baltimore, you will find interesting ones. The city is known for its diverse culinary atmosphere. So, when I stopped at her house and she told me that there was a restaurant in Federal Hill called Bluegrass, I was ready. Having traveled from Rehoboth, I was already hungry. Another friend, Peggy, joined us. Federal Hill was home to her many years ago before it became a trendy neighborhood. I was in good hands. 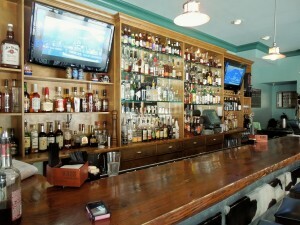 Bluegrass Tavern (Bluegrass) is located at 1500 S. Hanover Street, Baltimore, MD 21230. Tel. 410-244-5101. Website? 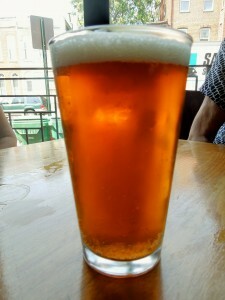 http://www.bluegrasstavern.com. General Manager is Kelli Kulnich. Monday is the only day they close. Reservations are accepted. The Executive Chef is Ray Kumm. His culinary path has taken him from Basserie Tatin, to Sotto Sopra, to Alizee, and a final stop at Bluegrass Tavern, where the cuisine is categorized as American and Southern cooking. 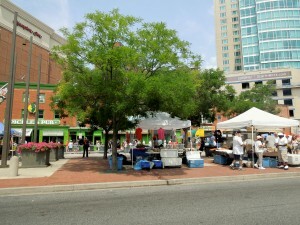 Federal Hill is just a few blocks from Baltimore’s Inner Harbor. A neighborhood with shops, restaurants, taverns, boutiques and galleries. Some call it SoBo (South Baltimore). In the historic district, many of its buildings are included in the National Register of Historic places. Federal Hill is very conveniently situated. Close to I-95, I-395, the Baltimore Washington Parkway, and to Charles and Light Streets. We arrived around 2 p.m.; a late lunch. Bluegrass has al fresco dining; not on such a hot summer day. It would have to be another time. We met Kelly Kulnich, the General Manager. She proceeded to take us to our table. Hank would be our server. 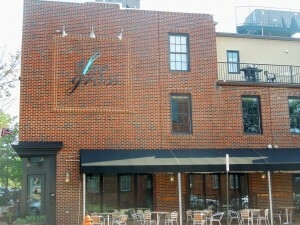 The restaurants has 2 floors; both with full bars. Bluegrass’ pride is the ability to perfectly pair their delicious food with drinks. A specialty of the Tavern is the focus on America’s finest Bourbons. 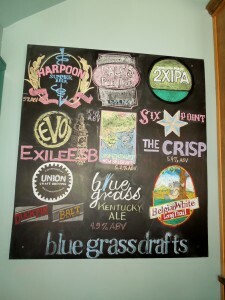 Beers from local breweries are on the board and on the menu. Charcuterie is the art of making sausages and other cured, smoked and preserved meats. It takes time but in the hands of an expert….haven!! Bluegrass has an array of charcuteries. 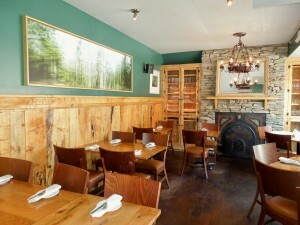 The restaurant is warm and cozy. Definitely, a neighborhood restaurant. Bar on the first floor. Bar on the second floor. 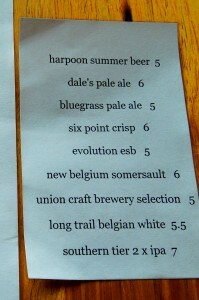 A few drinks were ordered, including a Bluegrass Pale Ale from Heavy Seas Brewery. 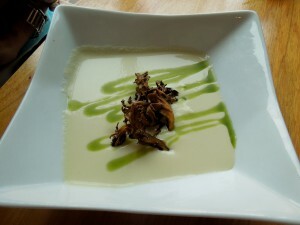 Kolrhabi Vicchysoisse – with lemon verbena garnished with crispy forest mushrooms. This cold soup was so amazing. A must if you are visiting Bluegrass. Light and smooth; vegan too. Beet Carpaccio – I love beets and these ones were gorgeous and tasted just as good as they looked. 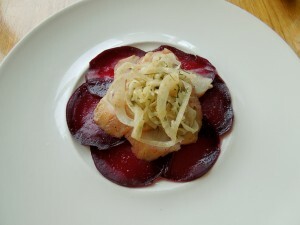 Served with smoked sable, pickled fennel and an orange vinaigrette. 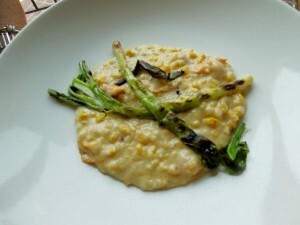 Corn “Risotto” – grilled welsh onions, fresh sheep’s milk cheese, bursted baby heirloom tomatoes. We all tasted it and it was awesome; we did not want it to end. It is a very popular dish at Bluegrass. Gluten free!! 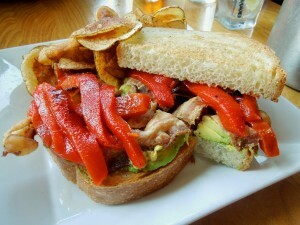 Bacon Avocado Sandwich with roasted peppers, escarole and chips. So gorgeous and Peggy loved it. A generous portion and very reasonably priced. We opened the sandwich so you could see how beautiful it was. 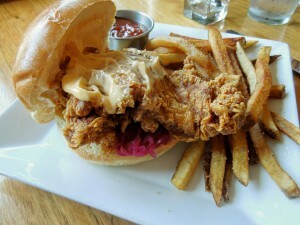 Mine was the Smoked Fried Chicken Sandwich with crystal hot sauce aioli, pickled red cabbage and fries. What a treat!! Very well seasoned and my taste buds were dancing happily. Again, we opened it. I hardly ever order dessert. It seems that I am usually satisfied. But, we had to order something. A dessert to share. I decided on the Olive Oil Cake…..just as I was saying that I was not a cake lover, the cake arrived. It was the best ever!! Moist, and just yummy. 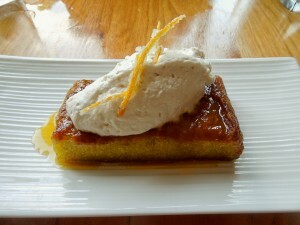 Gran marnier glaze, brown sugar chantilly, candied orange zest. Truly delicious!! Our server, Hank, was extremely courteous, knew his menu well, and let us talk and talk. Bluegrass gives back to the community that has accepted them so well. Each month they choose a charity or organization and donate 10% of the total gross earnings for just that day. 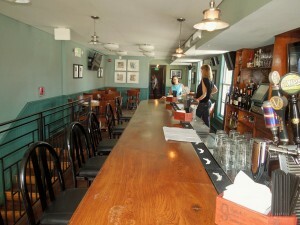 The Tavern is holding events and specials every week. 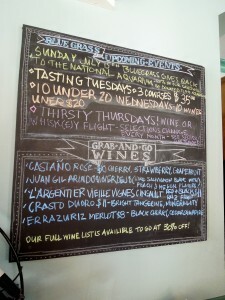 Please check the website or the board at the restaurant. Until Sunday, August 5th B’more is holding Restaurant Week. The opportunity to try all kinds of restaurants in Downtown Baltimore at a fraction of the price. 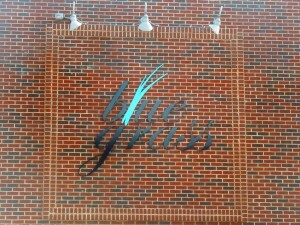 Bluegrass is one of such participating restaurants and you can check what they are serving by visiting their website. 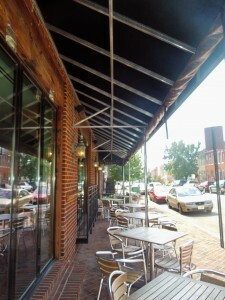 To see the participating restaurants, please visit http://www.baltimorerestaurantweek.com. 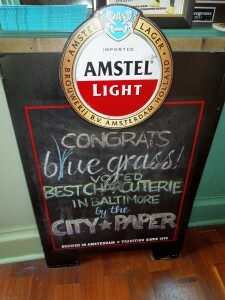 So….when in Charm City, please stop by. I cannot wait to have dinner!! Have a great day. Talk to you later. When my friend, Susan, told me that she had met the Pearl Lady at a French class, I did not have any idea what she was talking about. 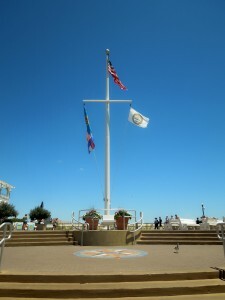 A short road trip took us to the town of Milford, Delaware, which is about 20 or 25 minutes north of Rehoboth Beach. Downtown Milford is transforming itself, with a lot of help from the people that care about this historic town. Galleries, shops, entertainment, restaurants, farmers’ market….the Mispillion River is the heart of this community, it has always been. 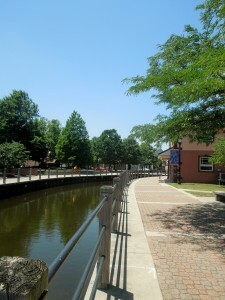 A pedestrian boardwalk goes parallel to the Mispillion River. The river passes through the center of Milford. It is approximately 15 miles long. It rises in northern Sussex County; flowing easter-northeastwardly to its mouth at the Delaware Bay. Want to know more? 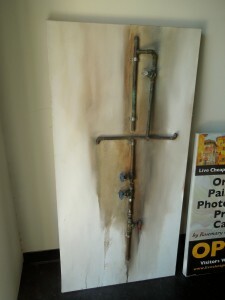 Please visit http://www.downtownmilford.org. 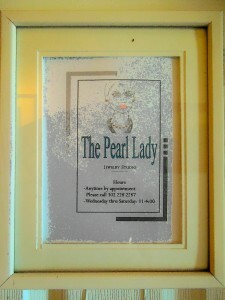 The Pearl Lady is located at 4 Park Avenue, 2nd Floor, Milford, DE 19963. Tel. 302-228-2287. 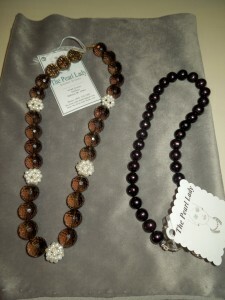 Email: The.Pearl.Lady-Studio@gmail.com. Website? 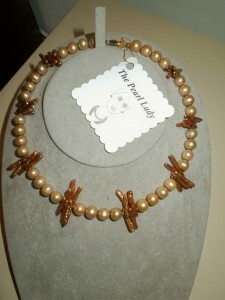 http://www.the-pearl-lady-studio.com. The entrance is off Walnut St., around the corner from the Mispillion Art League. She opens Wednesday – Saturday, from 10 a.m. until 4 p.m. By appointment, as well. 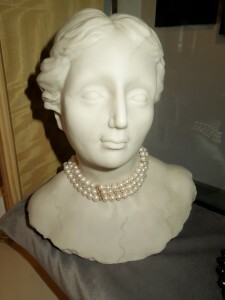 Meet Joan Frense-Mulholland, The Pearl Lady. The building is unique. 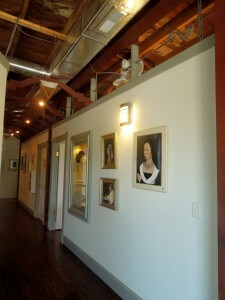 Inside, it is the home to other artists. 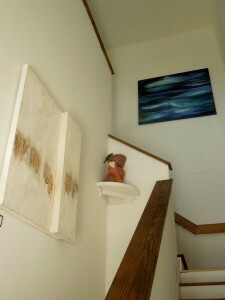 You can see their works of art as you are going up the stairs and in the hall. 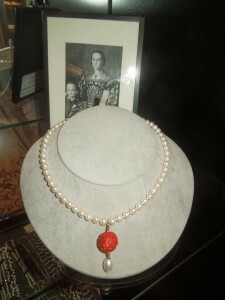 The Pearl Lady is at the end of the hall on the 2nd floor. Just as Susan and I arrived, other customers were arriving also. Greetings in French. What a surprise!! The ladies were looking for pearls to match an outfit. 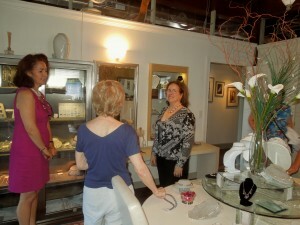 To see Joan interacting with her customers was a treat. Very friendly, making suggestions and taking into consideration what her customers want. Joan graduated from the Pratt Institute in New York. She traveled to far away places, working in the fashion industry. She went to Hong Kong; her job with Otto Versand, one of the world’s largest catalogue sales firm, sent her there. 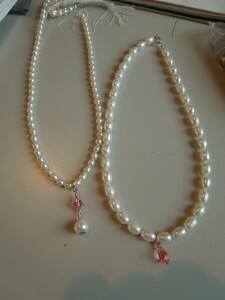 During her years there she studied pearls and started to make jewelry. She took classes in jewelry design, study the pearl history, and became knowledgeable in recognizing and grading freshwater pearls. She was lucky to be able to go to pearl farms and get the best quality before the exporters arrived. In the year 2000, Joan moved back to Milford and opened The Pearl Lady. Her designs include reproductions of museum pieces. Her clientele is both, international and local. Her work has sold at the Smithsonian, Winterthur, and the Delaware Art Museum, where she was contracted to make pieces that looked like the jewelry in the paintings. 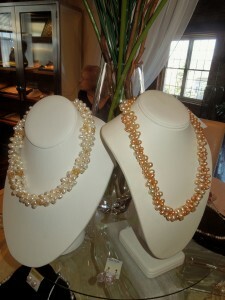 Joan gave us a little lesson on freshwater pearls. First of all, she said that freshwater pearls have gained in popularity in recent years because of the greater availability of highly lustrous pearls. 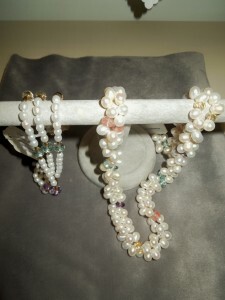 Freshwater pearls are the only gemstones that come just the way nature gives them to us. They come in a breathtaking array of colors and shapes. They are also “solid nacre (solid pearl)” and will be beautiful and lustrous for generations to come. You do have to observe a few precautions, though. Avoid getting perfume or hairspray on the pearls. The alcohol will damage the surface. 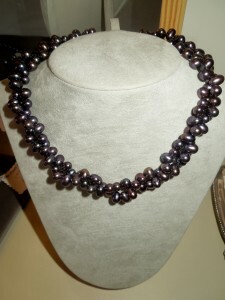 Clean your pearls by wiping with a damp cloth after each wearing. 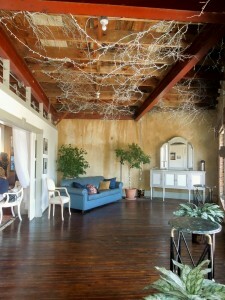 Keep the silk cord from getting wet, if could stretch. 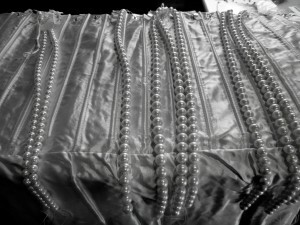 Pearls need air and moisture. Do not store in plastic. 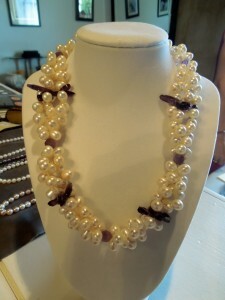 Joan has been stringing her pearls with wire, therefore, they will last longer. Just rinse them with water after wearing them. 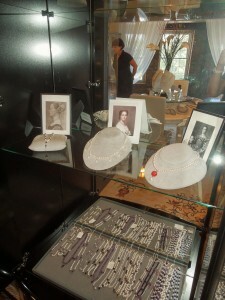 While visiting Joan showed us a few necklaces she was designing for bridesmaids. She offers classes through the Mispillion Art League. If interested, please e-mail her at The.Pearl.Lady.Studio@gmail.com. 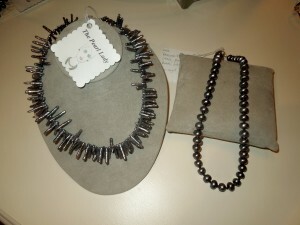 Please note that Joan can work with you for a custom piece. 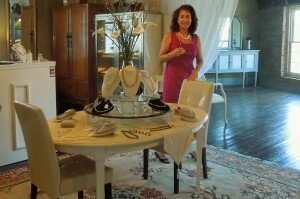 Her collection ranges from oblong pink pearls to large rounder pearls the size of a marble. Stop by and say hello, either in English or French!! It is something else; the phrase “through thick and thin” comes to play in this post. The Delaware and Maryland beaches are right next to each other. It is a small place, and if you live here you pretty much know everyone. When one of our own is in trouble we stop to help. This is what has been going on in Steve Falck’s life. He is a husband, father, and friend. Among his many passions; the ocean and surfing!! In 2009 Steve Falck was diagnosed with Multiple Systems Atrophy (MSA). If you don’t know what this disease is, believe me none of us around here did either. It is so rare, and progressive. A neurodegenerative disorder for which there is no known treatment or cure. And, if that was not enough challenge, during this year, Steve was also diagnosed with prostate cancer. Steve’s spirit has always remained strong; that has not changed. Some of the surfers in Ocean City, like Paul and Ross continued, while Steve was able, to help him get on that board to catch those waves in a modified surfboard, with special handles shaped by John Ashton. On July 29th, other friends have taken it to a different level of fundraising for Steve. It is called Paddle for Steve. Sandy Deeley and Teene Froiseth will be in the World Championship of Paddleboard Racing, the Molokai to Oahu (M2O). This race is considered the Mt. Everest of paddleboard events. Believe me, these guys have about 123 years of experience; they have been training hard. To qualify for the race, you must have previous race experience. The race is 32 miles across the infamous Ka’wi Channel known for the severe current, high winds and towering seas. A haven for tiger sharks, competitors are required to carry shark repellent which for this team is a 45 caliber “bang stick”. The channel is 2300 feet deep and is known as the “Channel of Bones”. Just completing the race is considered a crowning achievement in the sport. The goal? To raise $32,000. $1,000 for each mile paddled. Achieving this goal would help ease the financial burden this illness has created for the Falck family. The team is incurring all expenses for the race and every single dollar raised will go directly to pay expenses for Steve’s treatments. Please visit http://www.wepaddleforsteve.com. Your donations are needed and much appreciated. Note: Steve, Patty and the girls are so amazed and humbled. Like I said “through thick and thin”. It was my first Chick for Charity event. 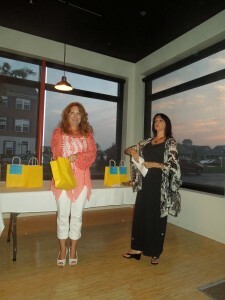 My friend, Jody, invited me to attend a fundraising evening. Amazingly so, I did know a few people. 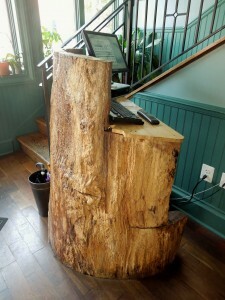 It took place at Fish On, which is located at The Villages of Five Points in Lewes, Delaware. Chick for Charity has a monthly dinner at Fish On. This evening’s beneficiary would be The Global Delaware Fund. Dinner, cash bar, silent auction and 50/50. Plus, you get to meet new faces. Chick for Charity is a group which mission is now well established 2 years after Kari Ainsworth and Marci Urgo decided to start this non-profit organization. Since that first dinner in 2010 they have “aided the residents of Sussex County. The organizations they have helped are essential community resource agencies that aid kids, families, the elderly, abandoned animals, and those that are undeserved and in need”. Their tel. is 302-362-2033. Website? http://www.chicksforcharity.us E-mail gals4thegood@aol.com. Matthew Haley (Matt) and SoDel Concepts founded The Global Delaware Fund. Helping so many here and abroad. Lots of plans for the future, Nicaragua, Ghana…there are big needs in our small world. 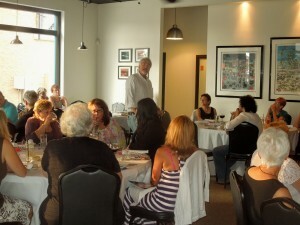 I have been to just a few of The Global Delaware Fund fundraising events. This intimate group got to hear Matt say that his direction in life; the passion for helping others came from someone giving him a chance, as well. The Global Delaware Fund is a non-profit organization dedicated to providing goods and services to children at risk in distressed situations; adults, locally and throughout the world. The beneficiaries are: La Esperanza, Crossroads Drug Treatment Center, Rehoboth Summer Children’s Theatre, Delaware’s Foster children, Youth Development: Domestic Skills Classes, Children and Families First of Delaware, Boys and Girls Club Delaware, Delaware Breast Cancer Coalition, Delaware Center for the Inland Bays, Pranjal Academy (Nepal), Victory House Boy’s. Mingling, chatting, making new friends….that’s how it all started. 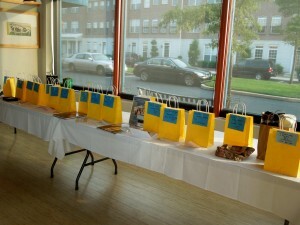 The silent auction with plenty of certificates. Tickets needed to be bought, placing however many you wanted in each bag. Again, I did not win a thing. Not even the 50/50. Oh well. Next time. On August 21st, the dinner will benefit Alex’s Lemonade Stand. A cash bar, salad and a buffet that followed. A summer dinner indeed. 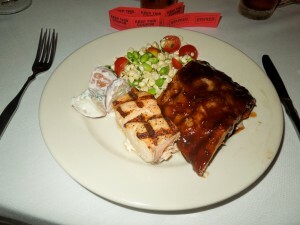 I filled my plate with potato salad, succotash, grilled salmon and barbecued ribs. 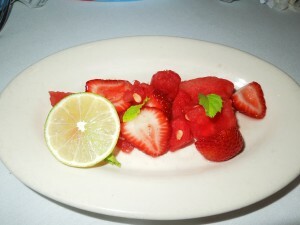 Watermelon and strawberries, another favorite, for dessert. Coffee, as well. Thanks for such a nice evening Chicks for Charity!! I’ll be back!! 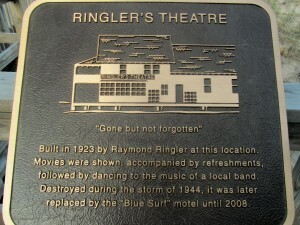 Links To Music Venues At The Delaware Beaches…. The Delaware Beaches offer a wide variety of music for everyone. Just click on the links to see their full schedule. 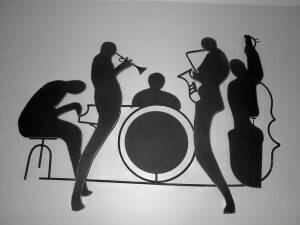 The following venues are, for the most part, restaurants, but there are others that music is their main event. Purple Parrot Grill – On Facebook. Tel. 302-226-1139. 134 Rehoboth Ave. 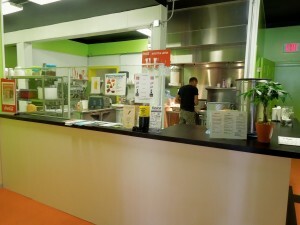 The Cottage Cafe – http://www.cottagecafe.com. Click on calendar. Note: If I have missed some, please let me know. I’ll be glad to add them to the list. Thanks. 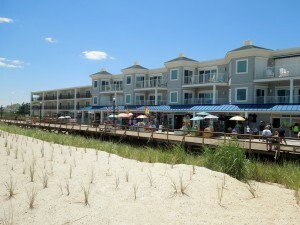 Comments Off on Links To Music Venues At The Delaware Beaches….